The word debrief came into popular usage during the early space programs. When the astronauts returned from outer space, the first thing they did was participate in an after-action review session so that findings from the mission could be captured while the experience was still fresh in their minds. Learning about those journeys to where no one had ventured before was riveting, and the information gathered in the review was so useful that the practice was widely adopted by consultants, educators, managers, and executives. In other words, to generate maximum learning in your workshops, you’ll be leading lots of debriefing sessions. So it makes sense to learn how to conduct debriefs effectively. When done well, debriefing is an amazingly versatile and powerful training tool that not only helps produce and solidify learning but also enhances group process. Improving the transfer of learning. Helping build a sense of community. An effective debrief raises important learning points, thereby reinforcing the information that’s most important to remember. Debriefing helps people learn from their experience. Debriefing is a way of learning from experience, which makes it an especially powerful training tool. As Blaise Pascal, the French philosopher and mathematician, put it, “We are generally the better persuaded by the reasons we discover ourselves than those given to us by others. Debriefing makes the collective experience of the group available to each person. Hearing how other participants experienced an activity broadens one’s own learning. For example, in a whole-group debriefing, some subgroups that have had successful experiences will not only testify to the usefulness of what’s being taught but may also relate some helpful how-to information. Other subgroups may struggle or fail to use the new abilities effectively, and a good debriefing will inform the whole group about pitfalls to avoid. Debriefing provides information from one’s peers. 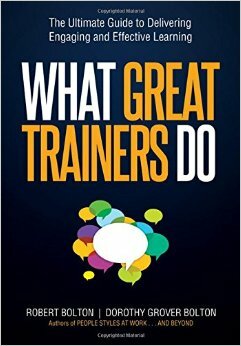 On at least some issues, a peer’s input may be considered more significant than that of the trainer. For instance, when the issue is applicability, a colleague is often deemed more credible than the trainer. A participant who might doubt that the trainer is a good judge of whether what’s being taught will work in the “real world” will probably pay a good deal more attention to the same point made by a fellow trainee. Debriefing airs misunderstandings. Misunderstandings often arise when people are learning new material. Also, some participants may doubt the practicality of using the methods and skills being taught but decide not to mention their skepticism. But when misunderstandings and objections aren’t raised, they remain unaddressed and, therefore, persist as ongoing obstacles to learning. Debriefing airs many of these misunderstandings and objections so that they can be resolved and no longer hinder learning. Improving the transfer of learnings. During debriefing sessions some participants are likely to describe how they’re thinking about applying their new learnings at work. Others might want to ask about the application of what they learned in a specific situation. This tends to prompt others to think about how they might use what they’ve learned back on the job. Debriefing increases participation. When debriefing, participants briefly describe their own experience or reaction to what just transpired. Since each participant is the best authority in the room concerning his or her own reaction, speaking during a debriefing is one of the easiest and safest ways of participating in a workshop — a benign way to dip one’s toe in the water. And once a participant has spoken in the group, it’s much less daunting to speak up again or ask questions thereafter. Providing knowledge about participants’ grasp of the subject matter. Debriefing sessions provide the alert trainer with an awareness of how well participants understand the material that was covered and how invested and sagacious they are in thinking about how to apply it. So participants’ debriefing sessions can be a useful evaluation time for the trainer. Help building a sense of community. Debriefing provides a way for people in a group to pay shared attention to shared events. When participants reflect on and discuss what they are experiencing, the cohesiveness of the group tends to be enhanced and the sense of community strengthened.